The ceremonies will be held on Wednesday 12 December 2018 in the Here East Theatre, which is adjacent to the campus. There are two ceremonies this year; one at 10.30am and another at 2.30pm. Make sure you know which ceremony you are meant to attend! Eligible students have until Wednesday 21 November to confirm their attendance. You must hire your academic dress (hat, hood and gown) from Ede and Ravenscroft at least 21 days before the ceremony. Hire your gown here. From 12pm until 1.45pm, we’ll be hosting a graduate reception with complementary lunch and drinks for graduates, guests and staff. Come along before or after your ceremony to catch up with friends or introduce your guests to members of the academic faculty! Why not extend the celebrations at one of the restaurants or cafes close to campus? Have a look at our food and drinks pages to find places to eat and drink within a close distance. 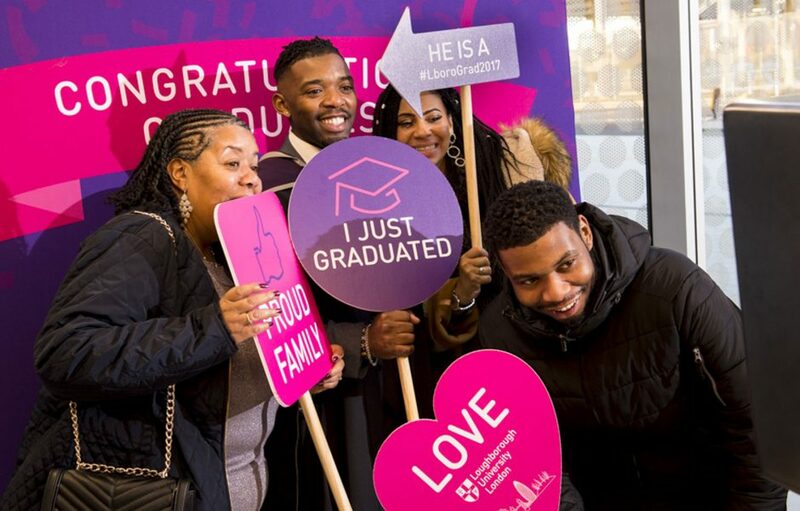 If you’re looking for further advice ahead of your graduation ceremony, have a look at our information for students and guest pages online. For more information about #LboroGrad2018, please have a look at our Graduation webpages. If you have any specific queries, please do not hesitate to contact the Graduation Office or the London team.